Becoming a Jew involves becoming part of a people. Like all nations the Jewish People has its own culture and civilisation, comprising religion, language, cuisine, art forms and other facets of life. Completion of Bet David’s Jews-by-choice programme is the first step to becoming a Jew. We hope that you will come to share with us our enthusiasm for what choosing Judaism represents. Abraham and Sarah were not born as Jews — they were the first to “choose Judaism”. Ruth, a convert to Judaism, was the great grandmother of King David. We recognise the tremendous contributions converts have made to Judaism. We also recognise the difficulties in the choice: with personal feelings, families of origin and certain members of the Jewish community. Our Congregation’s Jews-by-Choice Programme gives instruction in the basic belief system and practise of Judaism, from a Progressive, liberal point of view, as well as a basic command of the Hebrew language for the purposes of following the prayer service. The course is recognised by the South African Union of Progressive Judaism and therefore by the World Union of Progressive Judaism (the largest organised Jewish body in the world). It runs for a minimum of a 12-15 month period, enabling you to experience the full festival cycle, and to become acculturated into the Jewish People. This process will be enhanced by your active participation in all congregational activities. The more you participate, the more you will gain from the programme and a positive approach to your studies and congregational life during the year ahead will better prepare you for your future involvement in our congregation and as a member of the Jewish people; since becoming Jewish is more than just an accumulation of factual knowledge but rather a complete way of life. Taking on a new religious identity is not a frivolous thing. In fact, it can be one of the most profound steps in a person’s life. Our Rabbi invites those interested in Judaism to enroll in the Introduction to Judaism class. This class, which meets weekly at Bet David, includes one-on-one study with our Rabbi, the opportunity to attend worship services, and instruction on the ways in which one can become involved in our community in accordance with one’s interests and skills. 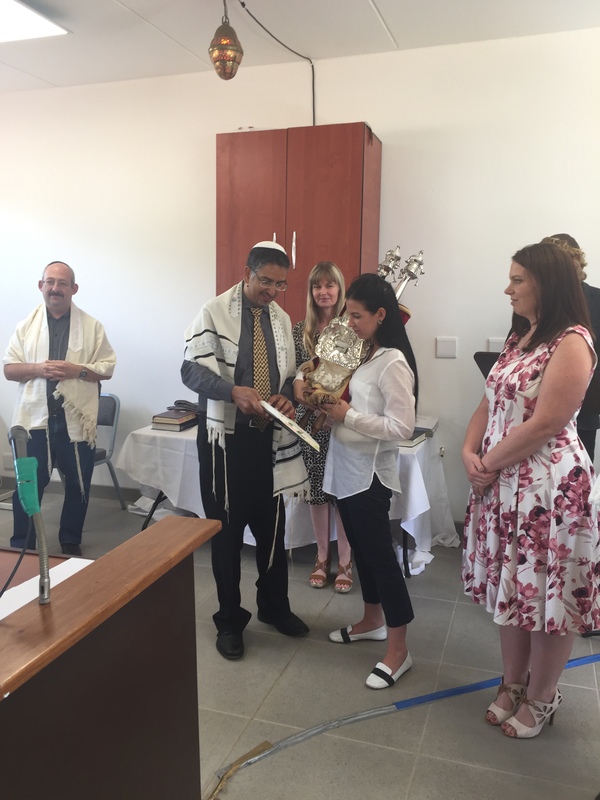 Choosing Judaism is a highly personal journey and not bound by a time frame, but when a student is ready to join the faith, he or she comes before a Rabbinic Beit Din. If you are interested in starting your journey, please get in touch with our office to schedule an appointment with Rabbi Schell (admin1@betdavid.org.za). Once your application has been approved, over the months to follow, you will be introduced to a thousand-year-old tradition — a way of life, a faith, and a people. The duration of the Jews-by-Choice programme is a minimum of 12 to 15 month so that you experience all the festivals as a class. The program is divided in 3 terms; intakes to join the program are in January and July only. We ask everyone who is planning a wedding in the aftermath of a conversion, NOT to schedule the wedding without consulting the rabbi. The Introduction to Judaism programme consists of two classes on a Thursday evening . Each Thursday consist of Hebrew instruction from 6.30pm to 7:30pm and Introduction to Judaism (7.40pm to 9.00pm). A detailed class schedule of the Introduction to Judaism classes will be sent to you at the beginning of the program. A Torah Study Group is led by Rabbi Schell every Shabbat morning from 8.45 – 9.45am which you are invited to attend . Attendance at all sessions and classes of Introduction to Judaism Course and Hebrew Classes are compulsory. [Excused absences by direct notification to faculty for ill health, travel required for work, planned leave]. Participants are responsible for work covered at missed lessons. Course attendance is compulsory for the prospective Jew by Choice, and partners are expected to attend regularly. Unexcused non-attendance may delay completion of study programme. Successful completion of assessments scheduled as part of the programme, and timeous submission of independent study projects are required before an invitation to the Bet Din can be issued. Prompt attendance at Shabbat Services is expected at Bet David or an out of town Progressive [SAUPJ/WUPJ] Congregation on Friday evening and on Saturday Morning services in addition to each evening & morning holiday and festival service in season (Purim, Passover, Shavuoth, Rosh HaShanah, Yom Kippur, Sukkoth, Atzeret-Simchat Torah). The ritual at each festival celebration is distinctive. Both evening & morning services are important components of the educational and spiritual experience. Shabbat Dinners, Passover Seder, Sukkah Meal, and communal Havdalah during the period of study as well as Congregational Shi’urim scheduled to accompany Shabbat & Holiday Services, Mitzvah School Prize-giving (Usually October), Mitzvah Day (Usually November) and Mandela Day (July) programmes. No sooner than 12 months, shall an oral examination take place at the Beit Din (rabbinical court). Only the Beit Din has ultimate authority for conferring Jewish status upon the candidate. Male candidates for Gerut should enter to into confidential discussion with the Rabbi about circumcision. To complete the conversion process, you are required to perform ritual immersion (mikveh). All candidates that have been passed by the Beit Din will then be able to take part in a declaration ceremony which will be held in the Synagogue after the Beit Din. For one complete calendar year following acceptance by the Bet Din and taking of a Hebrew name, candidates will maintain active membership and participation in Bet David. Bet David charges a tuition fee for the course that covers all costs involved in the process and includes rabbinic support for the conversion process, but not religion school fees for children, if applicable. During the period of conversion your Jewish partner (if applicable) must join the congregation as well. The process of learning and belonging is to be shared. Joining the synagogue expresses a commitment to being involved with the Jewish people, as does support of other Jewish organisations, locally and in Israel, as well. Please telephone or email Dianne Edel at 011 783 7117 or accounts@betdavid.org.za to discuss fees and payment.